How to find out the last time when Google crawled my website or in other words when a site was last time crawled by Google? Information about the last time when Google crawled your website can be very useful when troubleshooting why some of your pages do now show up in Google search results. Sometimes, it can just take some time for Google to get to your site and discover your new web pages, but other times there can be a bigger problem. Are you trying to make money with AdSense and you do not know whether your web page is indexed by Google? If you want to know when Google last indexed a site, there is a very easy way to find out. Second, type the name of your site in the search box. You can also enter a URL pointing to some specific web page that you are interested about. Third, locate the entry which contains your exact URL in the search results. If you are looking for your site, then look for the entry that contains your site URL and not that of any of the pages within your site. Note, if your web site or web page is not indexed by Google, then you will not find any results for your URL on the search results page. Fourth, once you find this entry, look for the link located right below your result called Cached. Fifth, click the Cached link. When you click the Cached link, Google takes you to the stored version of your web page. When you look at the top of the page, there is information about when was the last time Google indexed your page. 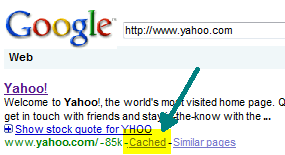 You can see that the Yahoo website was last crawled on 26 Jan 2009 at 17:18:05. You cannot change the crawl rate when your website is new, but if you have a website that has been online for some time and you have a Google Webmaster Tools account, you can adjust the Google crawl rate from Normal to Slower or Faster. See here for more details: How to increase Google crawl rate. Problems with getting your web pages indexed by Google? See if pagerank sculpting can help.